Sylvia Bennett's latest single C’est Magnifique is a magnificent way to start off the year. 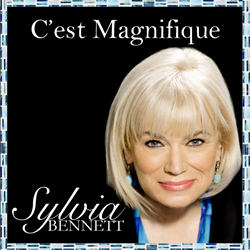 Following the 2017 chart-topping success of her last single Baby, It’s Cold Outside, International Recording Artist Sylvia Bennett is starting off the New Year with the release of the first single, C’est Magnifique, off her forthcoming album, “I Wish You Love,” due out in the Spring. C’est Magnifique is a whimsical, jazzy and upbeat version of the Cole Porter classic produced by long time musical collaborator and renowned Miami producer, Hal S. Batt. This catchy creation is sure to light up the Contemporary Jazz charts like Paris! Sylvia Bennett is a Grammy nominated pop jazz singer and song–writer who has performed at Presidential Inaugurations and opened for such renowned artists as Bob Hope, Phyllis Diller, Jackie Mason, Dizzy Gillespie, Barry Gibb and David Brenner. Discovered by the legendary Lionel Hampton, she has since captivated audiences and critics alike with her sultry and honeyed toned voice. She’s the inimitable, unforgettable Sylvia Bennett. C’est Magnifique is available for sale on Amazon, iTunes and CD Baby. Visit SylviaBennett.com for the latest news.